Myanmar (formerly Burma) is starting to really open up as a tourist destination. It's becoming increasingly popular and airlines are increasing frequencies and sending larger aircraft to cope with the steady rise of travelers and business people headed to the country. At the moment Thai fly 3 widebody aircraft a day between Bangkok and Yangon with a planned increase to a 4th daily service coming up soon. Thai recently announced it's low cost subsidiary Thai Smile will begin servicing Bangkok to Mandalay as well so options for travelers are opening up. 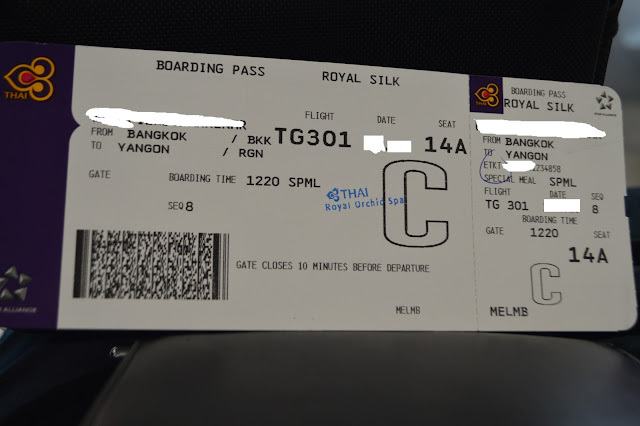 I recently ventured to Myanmar for the first time and found myself booked on a Thai Airways A300, the middle of the day departure flight TG301, in business class. The other two daily flights were scheduled to be A330's with a much better seat but for a flight that is in the air less than 60 minutes the A300 is fine. The flight was due to depart from Gate D1A, which is nice and central but unfortunately it is a bus gate which means the aircraft is parked elsewhere and all passengers were shuttled to the aircraft in several buses. Around 12.40pm boarding commenced and there was a mad rush to the counter! The staff were holding up signs for gold frequent flyers and business class passengers to board first but it was quite a struggle as many people surrounded the counter. I've never understood why people don't follow the boarding instructions but it seems to happen on every flight. I wanted to be on the first bus out and since I was entitled to priority boarding I pushed them out of the way (saying excuse me did not help) and headed to the bus. After a 5 minute trip by bus to the domestic terminal we boarded our waiting Airbus A300-600. 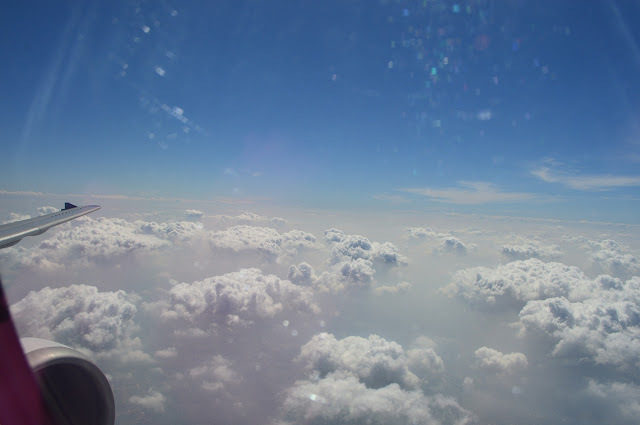 After taking my seat in 14A. welcome drinks including Champagne were offered. It wasn't long before every seat in business was occupied. It was a very full flight today. As you can see from the picture above the seats are just recliner style armchairs in a 2x2x2 configuration. Leg room is ok but not brilliant. The flight is under an hour so it's perfectly adequate. The crew came around with immigration forms for Myanmar before takeoff. Once everyone was loaded we left the gate, about 20 minutes behind schedule. We made our way to runway 01L and departed towards the north. It's confirmed - we are on an Airbus A300-600! The crew have a limited time to offer service on this sector, it's one of Thai' shortest international flights, so the meal service is on a single tray. Even so, it was quite generous I think! There was only one option of chicken with noodles but I had pre-ordered my meal online and had Massaman Chicken Curry. I had my Asus eeePad setup watching tv shows, I managed to squeeze it onto the table along with my meal. There is no personal on demand entertainment on this aircraft. The crew came around with wine and I had a glass of the white which was pretty nice. The meal itself was large for such a short flight but I found the massaman fairly average. Thai inflight catering standards have been dropping lately in my opinion. That Thai style dessert though was really delicious. We were soon on descent into Yangon but the captain announced due to congestion we had to do a few holding patterns at low altitude. I was surprised that flying into a place like Yangon we would experience congestion but it just goes to show how far they have come in recent years. Eventually after several orbits we touched down at Yangon International Airport and headed to the gate. There were lots of interesting airlines to look at on the tarmac including several local carriers. I also spotted a Vietnam Airlines Fokker 70 which I don't think I'd ever seen before. They are cute looking aircraft those Fokker 70's... I'd love to fly on one. We parked at a jetway and disembarked into the terminal. This is where it was handy to be flying in business as I was first to the visa on arrival counter and I had my visa sorted in no time, but the queue forming behind me as everyone else disembarked was huge! I had no baggage to collect so I was soon in the arrivals area and dealing with taxi drivers wanting my business for the ride into town... I soon accepted their offer and was on my way. I will follow up with a few pictures around Yangon in my next post!